A beggar was exposed as a fraud after being caught walking. 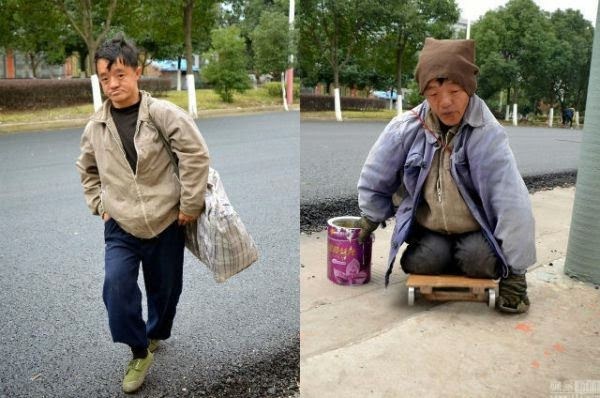 The beggar who claimed to be a paraplegic, was seen using a skateboard to get around Wenling, Zhejiang, China. People helped the sad-looking man by giving him cash. The man managed to get the sympathy of many people who thought he was paralyzed from waist down. The man added some drama to his situation by playing soft music and pulling himself around on the skateboard. The reporter decided to follow the beggar and learn more about him. To his shock, he discovered that after a day of begging as a paraplegic, the man hauled himself to the side of the road and began walking. The man took off all his ragged clothes and put them in a bag. He then removed his dirty socks, put on shoes and stood up before rushing to get on a bus. According to the Shangaiist, fake beggars can earn more than 10,000 yuan a month in Nanjing, Jiangsu province, China. And just last week, a photo of a beggar holding an iPhone in Beijing triggered hot discussion online.